Homeopathy is a whole medical system that originated in Germany. The fundamental idea of homeopathy is the Similarity Principle, which implies that substances capable of causing disorder in healthy subjects are used as medicines to treat similar patterns of disorder experienced by ill people. Homeopathic medicines are aimed to direct and stimulate the body’s self-regulatory mechanisms. Homeopathy is highly individualized while taking into account the symptoms and signs of the disease, the patient’s physical build, personality, temperament and genetic predispositions. Apart from homeopathic medication, advice on change of lifestyle, diet and substance-abuse behaviours, acquisition of stress-reduction techniques and exercise are part of the package of care provided by homeopathic doctors. Approximately 45,000 medical doctors in Europe have taken training and education in homeopathy. Many more doctors in Europe prescribe homeopathic medicines without any homeopathic training: approximately 25-40 % of the GPs from time to time, 6-8 % of them on a more regular basis. 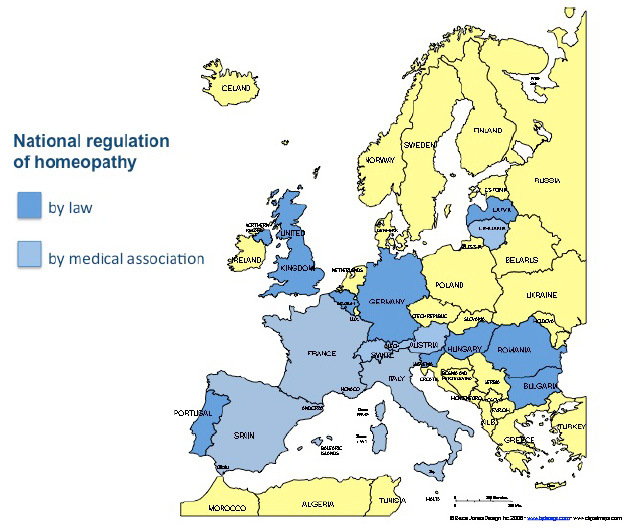 Homeopathy as a distinct therapeutic system is recognised by law in Belgium (1999), Bulgaria (2005), Germany (1998), Hungary (1997), Latvia (1997), Portugal (2003), Romania (1981), Slovenia (2007) and the United Kingdom (1950). In Bulgaria, Hungary, Latvia, Romania and Slovenia, countries with a monopolistic system, for medical doctors only. In Belgium and Portugal the law does not explicitly exclude non-medically qualified practitioners, but has not yet been implemented. In Slovenia, although the law permits medical doctors to practise homeopathy, the medical association withdraws doctors’ licenses if they actually practise homeopathy. In some countries where the government delegates the tasks of authorisation, registration and supervision of health professionals to the national medical associations, statutory regulation has been introduced by the national medical associations, e.g. in Austria and Switzerland. In Lithuania it was the national institute of medico-legal affairs that regulated homeopathy. The national medical association in Italy has recognised homeopathy as a distinct medical method and called on the government to provide the necessary legislation. In Latvia the medical association/council/chamber has recognised homeopathy as a medical specialty. In the following countries as an additional medical qualification: Austria, France, Germany, Hungary, Italy, Latvia, Lithuania (almost subspecialty), Romania, Spain, Switzerland (subspecialty for GPs, paediatricians and internists). In Austria, Germany, Lithuania, and Switzerland the diplomas of homeopathic doctors are issued by the national medical association/chamber/council, in other countries usually by the national homeopathic doctors’ association. Diplomas issued by the national homeopathic doctors’ association are officially approved by the government in Latvia and Romania and are recognized by the national medical council/chamber in Romania. Optional familiarisation courses about homeopathy are provided in the medical undergraduate curriculum as a part of a course on Complementary and Alternative Medicine in France (some universities), Germany (one university), Hungary (one university), Italy (some universities), the Netherlands (most universities), Romania (some universities), Spain, Switzerland and the United Kingdom; as a separate subject in Belgium (one university), Bulgaria, Germany and Romania. Postgraduate training courses in homeopathy for doctors are provided at universities in Bulgaria, France, Germany (five universities), Greece (some universities), Italy (one university), Lithuania, Poland (eight universities), Romania (eight universities) and Spain (three universities), in other countries at private teaching centres only. Homeopathy is an official part of the Continuous Education Programme for doctors in Hungary and Romania. 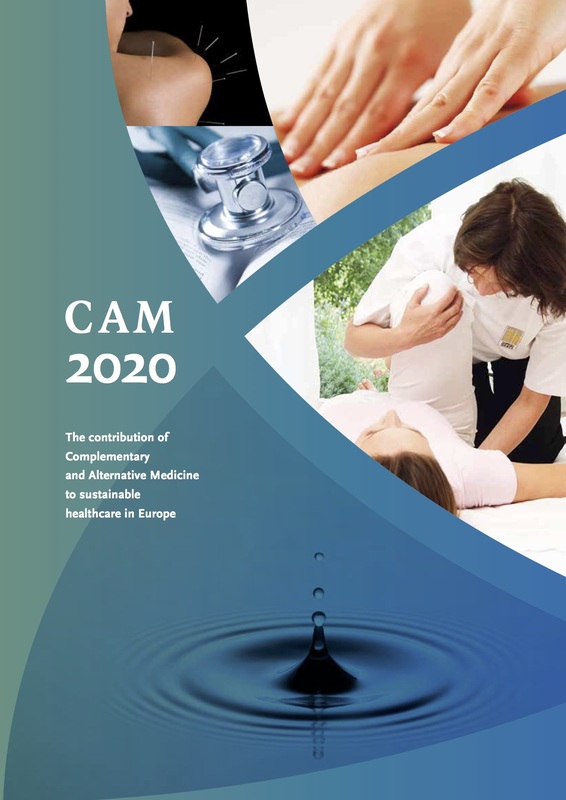 A lectureship specifically for homeopathy exists only in the Netherlands (Amsterdam), a professorial chair of CAM including homeopathy in Hungary (Pécs) and Switzerland (Bern). Several hospitals in Europe, in their out-patient departments, currently provide homeopathic treatment by physicians, i.e. in Austria (seven), France (two), Germany (five), Spain (two), Italy (some). There are four dedicated public sector homeopathic hospitals in the United Kingdom. Continuing Medical Education in homeopathy is obligatory for all homeopathic doctors in Lithuania and Romania (controlled by the government), in Hungary and Romania (controlled by the national medical associations/chambers/councils), and in Belgium, Bulgaria, Latvia, Netherlands, Romania, Slovakia, Switzerland (controlled by the national homeopathic doctors’ associations). The European Union has recognized homeopathic medicines as medicinal products. All EU Member States are obliged to register homeopathic medicines pursuant to Directive 2001/82/EC (veterinary use) and 2001/83/EC (human use) - amended by Directive 2004/28/EC and Directive 2004/27/EC respectively - on the Community Code relating to medicinal products. However, the legal framework for homeopathic medicinal products is not adequately tailored to the particular characteristics of these products and has led to a significant reduction in the number of homeopathic medicinal products on the market. The current regulatory framework functions successfully in only a minority of EU Member States. In 10 EU Members States no homeopathic medicinal product has been granted an Art. 14 Simplified Registration status. 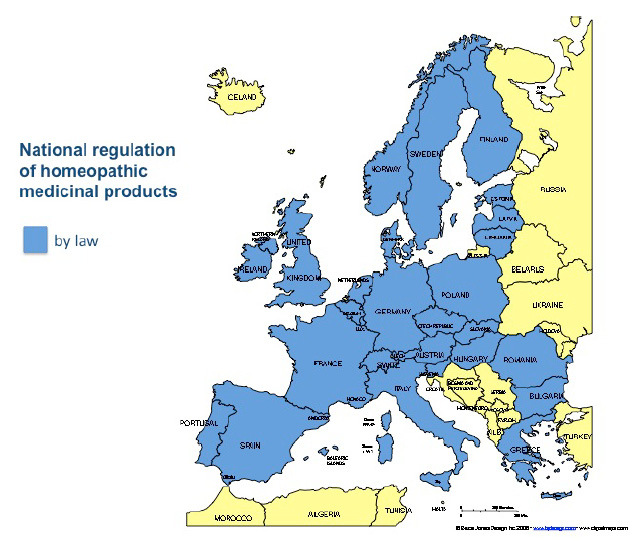 In Belgium, Italy and Spain no products have yet been registered or authorised, even though thousands of products have been officially notified for registration or authorisation in each of these countries. In Portugal, out of 40,000 notified products, around 800 have been registered. In the Netherlands, out of 11,000 notified products, less than 4,000 have been authorised or registered. The remaining products are no longer available for prescribers and users. In the UK, of over 2,700 products granted a license in 1973, less than 50 have been authorized; out of more than 20,000 single remedies on the market, only 200 have been granted a simplified registration so far. This means that doctors, practitioners, patients and consumers are being deprived of access to the medication of their choice in many Member States. In Belgium and Romania the fees for homeopathic treatment are covered by the national health insurance system, in Belgium, Bulgaria, Germany, Hungary, Netherlands, Switzerland by additional private insurance companies. There is only partial coverage in Belgium, Latvia, and Romania. The costs of homeopathic medicines are covered by the national health insurance system in Belgium, Switzerland and the United Kingdom; by additional private insurance companies in Belgium, Germany, Hungary, Italy, and the Netherlands. There is only partial coverage in Belgium and Portugal (as magistral formula).